Know Mayfair High Class of 1970 graduates that are NOT on this List? Help us Update the 1970 Class List by adding missing names. Pete Smith and I would like to try and organize a 40 year reunion around late Oct 2010. Anyone interested with names and contacts appreciated. 40th Reunion at The Grand on Willow Oct 23, 2010. Friday nite mixer (TBD at The Marriott), Sat morning 9 hole golf at Little Rec, and Sunday Picnic at Mayfair Park. Cost for Dinner is $75.00 Per person. Payable Don Haselroth, 3910 Clark Ave, Long Beach, CA 90808. More info on Facebook, just "search" Mayfair and choose Events link. Also on Classmates, but prefer FB or this site. More 1970 alumni from Mayfair HS have posted profiles on Classmates.com®. Click here to register for free at Classmates.com® and view other 1970 alumni. 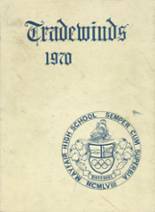 Missing some friends from Mayfair High that graduated with you in 1970? Check the list below that shows the Mayfair class of '70.